Match your skills to the job. If your skills and background don’t match the job, don’t send the letter unless you are confident that your skills are in the ballpark and you have a friend at the company. Don’t get cute. A cover letter structure is basic. Let the reader know what position you want, where you saw the position and what you have to offer. Your life story and your passion are unnecessary. HR is not interested in your life story. In fact, HR is probably inserting your cover letter into scanner software that hunts for specific keywords that match the job description. Return to the importance of reading the job description above. Suppress your emotions. Save dazzling them with your personality for the interview. Sob stories or rage about how you were laid off will not faze HR. They are looking for skills only, and in this economy everyone has been burned. More after the jump! 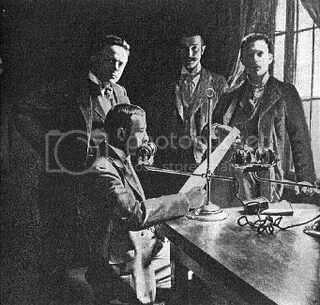 Photograph of a stentor (announcer) transmitting a program at the Budapest Telefon Hirmondó, which appeared in the “The Telephone Newspaper” by Thomas S. Denison, in the April, 1901 World’s Work magazine.” Image public domain from Wikimedia Commons. Highlight your skills in boldface. I use this in blog posts all the time. I even use it on the home page of my web site (Writing, Editing, Content Management). People in HR must read quickly. They will look upon you fondly if you make it easy for them. Highlight talents such as “10 years of editorial experience” in bold, and then add a sentence or two about your talent after the boldface headers. Don’t boldface anywhere else; wacky typography is a turn-off. Stick to one page. The formula is simple: One paragraph as an intro. Three or four short paragraphs describing what you have to offer. A closing telling HR where they can find your resume (either sent in the body of the email or as an attachment). Ask your friends to proofread it. Either that, or set it aside and read it after a day or two. Above all else, make sure you got the job title and job location right. A surprising number of people make this mistake. You don’t want to be the guy who claimed to be excited about an opening at Yahoo! but you sent the letter to Google. Subscribe to comments with RSS	or TrackBack to 'Cover Letter Do’s'. Amen to the advice to keep it short. A few years ago, my advisor gave me a copy of his job letter, and it was barely over a page long, but every sentence mattered. My job letter was twice as long and I was not nearly as successful (though I’m sure my job letter was only one factor). If the number of applicants has increased as much as has been reported, then all the more reason to keep it snappy!